Few developments in the 21st century conjure up as many economic and racial ghosts as gentrification. For urban denizens of all persuasions, debates regarding gentrification unfold like a typical over the top episode of HBO’s True Blood, complete with bloodletting and sacrifice. The problems and issues raised by this process remain complex and contradictory. While race certainly continues to be a factor, reducing the issue to black vs. white oversimplifies what has become a truly mind bending dialogue. For example, in Chicago, as public housing projects were razed, resentments toward whites moving into new “affordable” housing provided only one source of tension. Working class Blacks in historically African American Bronzeville and elsewhere viewed the influx of upper middle class Blacks (derisively described as Buppies by some local residents) with an equally wary eye. Moreover, the influx of Mexican immigrants to Chicago and South Asian and East Asian counterparts in Queens and Brooklyn have complicated the usual black white binary. As T of M has noted continuously, authors like Saskia Sassen and Mike Davis argue that these immigrant communities in their own way bring with them a low level gentrification that may or may not threaten long established working class communities. Still, others like Josh Sides (another T of M favorite) have noted that sexuality has played a role as well, pointing out that in places like San Francisco’s Castro district, upwardly mobile and affluent gays refurbished a once working class community. While this undoubtedly raised property values and made the Castro a more economically desirable neighborhood, it came in large part at the expense of the long standing lower income residents.All this is too say, debates about gentrification too often result in a confused jumble of explanations that, as the Atlantic’s Megan McArdle rightly notes, mix “normative and . . . positive arguments.” In other words, the debate confuses what is with what should be, which are rarely the same thing. 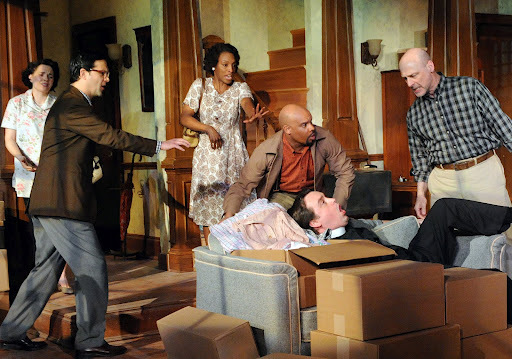 The 2011 Pulitzer Prize winning play Clybourne Park (currently on display at Washington D.C.’s Woolly Mammoth Theatre) wades deeply into process of gentrification. Taking place in Chicago’s well known Clyborne Park, the play consists of two acts, separated by 50 years of neighborhood change. Its first act refracts Lorraine Hansberry’s famous play, A Raisin in the Sun so that the story unfolds from the perspective of the white family selling the home. Not wanting to reveal one of the central undercurrents of the plot, the family (consisting of Russ and Bev) has chosen to move largely as result of a family tragedy that altered their relationship to the surrounding community. Indeed, the term community itself morphs into a term of derision when uttered by family patriarch Russ toward his intrusive neighbors who fear the sale of the home to a working class black family will ultimately result in neighborhood decline. The play’s first half exhibits equal parts mourning, racism, classicism, and anger. Needless to say, Russ cares little for the future of the neighborhood nor those residing in it. Though it starts slowly and at times seems cryptic, the first act moves swiftly, setting up the play’s second act well. The first act consists of six characters including Black housekeeper Francine and her dutiful husband Albert along with local minister Jim and neighborhood couple Karl Linder and wife Betsy. Yes, this is the same Karl Linder that attempted to bribe the Younger family (from Raisin in the Sun) from buying the house on Clybourne Street that Russ so willingly hopes to vacate. Having failed in his efforts with the Youngers, Karl turns his attention to convincing Russ to reconsider the sale. Ultimately, the first act operates much like, what one critic perceptively described as “a combustible mix of race, territory and property prices that it is like a hand grenade lobbed into the stalls, primed to explode in the second act.”. And what a second act it is. Undoubtedly, Norris refuses to provide any kind of sanitized politically correct outcome or comfort for the play’s characters and audience. New York Times critic Ben Bentley summarized the effect as the “equivalent of [Norris pouring] itching powder on his characters and on us.” Guardian theater critic Lyn Gardner agreed, “It’s like watching a boil being lanced. Along with the rest of the audience, I squirmed like a worm on a hook.” Moreover, Norris undermines any sense of moral superiority or cosmopolitanism that a 2011 audience might feel watching their 1959 counterparts as the second act reveals the messiness and sometimes eviscerating conflicts that seem all too familiar in today’s urban areas. For all we have learned, we seem to have also apparently forgotten. As the second act begins, a white couple, Steve and Lindsey, has purchased the house but has run into some resistance from a predominantly black local homeowners association that wishes to preserve the historic nature of Clybourne Park’s unique bungalow style. Steve and Lindsey want to alter the height of the home while also putting a “koi pond” in back. Needless to say, the local homeowner’s group disapproves. In the years following the 1959 sale, the neighborhood’s demography changed from all white to all black. Economic decline followed as did some levels of struggle, but so too did the sense of community which the second act’s black characters, married couple Kevin and Lena, wish to emphasize to the new tenants. (the play basically uses eight actors total, seven of whom appear in both the first and second acts). What emerges from this constellation of personalities is a cacophony of rhetoric that obscures the real meanings that lay beneath it. Norris cleverly allows characters to hang themselves while drawing the audience in through a rather innovative means: racial jokes. Though each joke serves as a sort of hinge around which conflict emerges they also propel hostilities. The play builds as each joke surfaces revealing as much about those hearing the joke as those telling it. When Lena tells a particularly offensive yet admittedly entertaining joke about white women, Lena’s own prejudices come into full view, as do those of pregnant new homeowner Lindsey. Still, the dialogue of the second act also provides a means to blow up the very discourse we have come to employ in discussions of gentrification and race. The Guardian’s Garner gets at this most clearly, describing it as the “most offensively delicious skewerings of the resentments and real feelings that lurk behind the euphemisms and politically correct rhetoric of racial discourse ever to erupt on a stage.” From a purely artistic perspective, if there is a criticism of the play it might be that the characters, notably its white homeowners, could be seen as caricatures (or “cartoonish” as Brantley notes), while its black characters seem almost guileless, though admittedly, Lena’s actions suggest differently. Without question, Clybourne Park, a comedy, is worth seeing. Its dialogue spins out to address issues relating to gentrification, race, class, and military conflict abroad in postwar America. However, while Norris has consistently noted he never intended the play to encompass all of Chicago’s racial history, urbanists will see holes. For example, the black white binary upon which the play is set ignores the increasing numbers of Asian and Latin American immigrants to urban communities. Moreover, the idea that gentrification remains a process driven strictly by white interlopers (who newspapers continue to describe as “pioneers” which remains one of the more unfortunate aspects of this kind of discourse) persists. The increased presence of South Asian and East Asian American professionals in transitional neighborhoods, Black upper class couples moving into gentrifying working class white and black communities, and other examples complicate our understanding of such developments. Undoubtedly, local demographics play a role. If a city lacks a large South Asian/East Asian or Latino population, the language of gentrification will reflect this. Take Atlanta for example. While the city has recorded gradually increasing numbers of Latino and South Asians, many hail from lower income populations so they in all likeliehood simply haven’t been able to accrue the necessary capital to participate in the process, at least not yet. 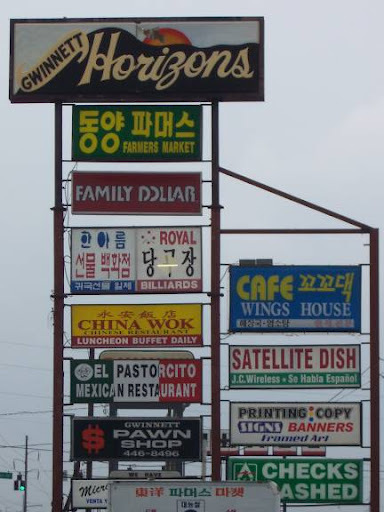 Then again, the area around Atlanta referred to as “outside the perimeter” (think Buford Highway and Chamblee), has increasingly reported South Asian and East Asian homeownership. The Economist has documented this development most extensively in its March 11, 2004 issue (“Into the Suburbs”). Within Atlanta’s city limits, however, the Black white dynamic retains great resonance. Atlanta’s own identity rests deeply on its history as the “city to busy to hate”; the idea that its black and white business leaders blunted racial conflict for pragmatic entrepreneurial policies. Of course, like any other constructed identity, Atlanta’s probably oversimplifies its complex history of race relations. In White Flight: Atlanta and the Making of Modern Conservatism (2005), Kevin Kruse questions this identity. Kruse illustrates that the “city to busy to hate” moniker disguised a troubling racial logic that eventually led to neighborhood and school segregation, even if no one described it that way. White Flight, like predecessors such as Thomas Sugrue’s seminal Origins of the Urban Crisis, explores the role class played in neighborhood transitions of the 1940s and 1950s. Working and lower middle class whites could not flee to suburban areas, so the various “coalitions” established across racial lines that allegedly made Atlanta the “city that was too busy to hate”, favored black and white elites. 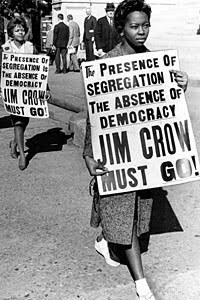 In Atlanta, upper class and middle class whites displayed an open attitude toward integration as they sent their children to private schools and buffered community desegregation through working class white populations. Much like the noxious Karl Linder of Clybourne Park, working class whites feared their investment would decline once African Americans moved into the community. While racism played a central role, so too did HOLC and FHA lending policies that heavily influenced private lending practices. This meant working class whites sold low out of fear of losing all their investment, while upwardly mobile Blacks paid high as they found fewer neighborhood available to them. While Clybourne Park’s Russ sold the house low out of grief, one wonders if the Youngers benefited from this discount or if the broker found a way to pocket the difference. Patriarch Russ’s derisive use of the term “community” illustrates a similar function that Kruse points out perverted its meaning. For local Atlanta white communities, the language of community, community protection, and freedom of association became buzzwords for resistance. Initial resistance focused on constructing an “established white community” then using the language of community protection to prevent integration. However, these constructed communities often lacked the kind of social capital, institutions and connections that normally define such. As result, the encroachment of black homeowners into white areas met with predictable responses. Those closest to the transition sold their homes turning a profit as blacks often paid higher prices than whites. This of course drew the rage of fellow white homeowners who lived further away from area of transition; they viewed the actions of whites selling their homes as traitorous. Such developments exhibited the role class played in fracturing opposition to racial succession. Russ’s self interest lay not in economics, but his own disappointment in the alleged community to which he thought his family had belonged. Clearly, race did not amount to any sense of community for Russ and Bev. What about third forces, like realtors, who engaged in block busting in the past and now rebrand neighborhoods, essentially obscuring their history? Over the past 15 years New York’s Brooklyn and Manhattan neighborhoods have endured an endless stream of such rebrandings. New York State assemblyman Hakeem Jeffries has attempted to legislate against realtors engaging in such practices. According to Jeffries, “neighborhoods have a history, culture and character that should not be tossed overboard whenever a Realtor decides it would be easier to market under another name,” he told the NY Times. Jeffries resented in particular, recent attempts to rename the Prospect and Crown Heights area of Brooklyn as ProCro. To be fair however, this is a process that has been unfolding for much of New York City’s twentieth century. After all, Tribeca was never Tribeca until labeled such in the 1970s. So how does one contextualize Norris’ second act? A recent trip to Prospect Heights reveals a neighborhood that remains a mix of urban professionals, working class West Indian American residents, bodegas, and boutique restaurants such as Dutch Boy Burger. Wandering around with Indian American professional Suman Ganguli, a Minnesota born Prospect Heights homeowner, one can clearly see that gentrification as “white driven evil process” fails to really capture its complexities. Ganguli represents your stereotypical South Asian American striver. 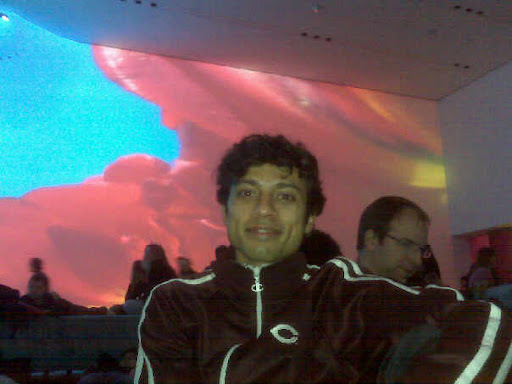 A University of Chicago, Cornell, and Berkeley graduate (Tea Party members might consider him of the “liberal Ivy jet set crowd” they so abhor), Ganguli and his wife recently purchased a condo in Prospect Heights. He admits that when one uses the word gentrification his “knee jerk politically correct response” is to oppose it, however, this obscures some realities Ganguli acknowledges benefit the community. For example security, infrastructure, and nice restaurants/bars not only fit nicely into his family’s lifestyle choices they also benefit many local homeowners by raising property values. While this may penalize renters, one imagines numerous minority homeowners regard rising property values as a boon.With that said, he also worries about too much change, “I’d like to see some of the accompanying benefits of gentrification …. but I don’t want to see it fully tip over, so that this becomes Park Slope,” he noted in a recent email. “It’s a fine balance, perhaps an unstable equilibrium, as they say in applied mathematics/dynamical systems … I don’t want to see the people on our block–which is remarkably diverse, racially and socioeconomically–that have been here priced out as a result.” This is the crux of the problem. While certainly, many homeowners benefit, there are those who will simply not be able to afford the increasingly high property taxes that accrue, thus, some working class homeowners may have to move from the very community they helped to establish. Obviously, as both Kruse and Ganguli suggest, class matters especially in regard to consumerism. When the characters from Clybourne Park’s second act recount the travails of the local grocery store beginning as a locally owned business collapsing into a supersaver outlet (think 99 cents store) then transformed into it’s latest incarnation, a Whole Foods, the audience laughed uproariously. Yet, this laughter stems from a knowingness about our current existence: consumption. While race plays a role, gentrification represents as much about how we choose to consume and what it says about us. Writing for the Atlantic, Benjamin Schwartz noted that recent attempts by authors to address the issue of gentrification foundered on their inability to recognize this fact. Indeed, what has changed since [Jane] Jacobs’s day—and the reason, as these books attest, that gentrification has become so intense an issue—is the speed of the transition of districts from quasi dereliction to artsy to urban shopping mall. This acceleration results from the ways consumption has become the dominant means of self-expression . . . and from—relatedly, ultimately—the acceleration of the global economy. Moreover, the use of the Korean War as a central plot device, the first US led war that featured an integrated military, announced America’s new foreign policy of internationalism and lacked a clear cut American victory, symbolizes more than at first seems apparent. The war ushered in numerous racial, demographic, and yes, militaristic changes in US culture. Norris embeds the war’s meaning into the play in a way that obscures this reality but upon further reflection becomes a glaring fact. After Korea, suburbanization exploded, cities declined, civil rights emerged, and America, arguably, peering back from the distance of 2011, began a slow descent from superpower to global power, all while US consumerism rampaged forward, damn the torpedoes. In the early 1970s, sociologist Thomas Schelling put forth the now ubiquitous term “tipping point” to describe the kind of rapid neighborhood transition that unfolded in Clybourne Park. Schelling famously assigned whites “tolerance levels” for the numbers of new black residents in a neighborhood. Blacks too had their own set of expectations regarding white residents but that it allowed for far greater flexibility. However, while in no way diminishing his racial analysis, Schelling also noted that factors other than race played a role as well. Ironically, Schelling argued that “well defined neighborhoods” or as Clybourne Park’s Russ may suggest “communities” illustrate faster tipping points as residents’ own definition of the community changes as result of new inhabitants while “ill defined” communities absorbed new arrivals better since their attachment to a neighborhood identity remained more diffuse. Of course, one might argue this contradicts Kruse’s earlier point about Atlanta, but it provides food for thought. Clybourne Park drops observers into central debates around gentrification encompassing race, class, and consumerism. How one views these developments hinges on these very factors, making Bruce Norris’ play a valuable reminder that gentrification, much like life itself, is pretty messy.